« Weight Watchers: Lose Weight to Save the World? 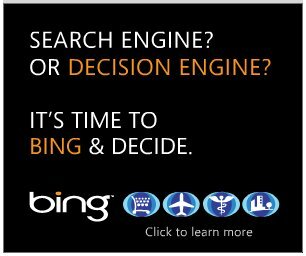 This is a banner ad for the search engine Bing. There are many designs with the same text. So, what is a decision engine and how is it different from a search engine? See, it doesn’t sound like something I’d want, since I don’t generally want other people deciding what I want for me and that’s the only thing I can imagine this means. And if it doesn’t mean that my free will when browsing the internet isn’t taken away from me, then what does it mean? Am I only going to be given one result for a search query because Bing “decided” that was the best one? Is Bing going to “decide” if I’m looking to get information about ponies or to buy one when I search for “ponies”, regardless of what I might have actually wanted? Or is it something else? And the fact that I’m so uncertain about it and currently pretty sure that whatever a “decision engine” is, I don’t want one, says that this is probably not a very good advertising campaign. Clarity is important. And it’s important not to suggest you’re going to take away what people are getting already, because if you are, why would they want to switch to your product? This entry was posted on February 11, 2010 at 12:00 pm	and is filed under Electronics. Tagged: banner-ad, bing, search-engine, website. You can follow any responses to this entry through the RSS 2.0 feed. You can leave a response, or trackback from your own site. Have you seen the series of TV commercials they ran with people saying completely random words for no apparent reason? That campaign really annoyed me. It doesn’t take a rocket scientist to sort through search results and find the ones you want! I missed those! I’ll have to look for them.